Your Own Custom Annotations – More than Just Comments! In this article, we are going to look at how we can create and use our own custom annotations in a Symfony 3 application. You know annotations right? They are the docblock metadata/configuration we see above classes, methods and properties. You’ve most likely seen them used to declare Controller routes (@Route()) and Doctrine ORM mappings (@ORM()), or even to control access to various classes and methods in packages like Rauth. But have you ever wondered how can you use them yourself? How you can define your own annotation and then use it to read information about a class or method without actually loading it? Before we do this, a small disclaimer is in order. Annotations have nothing to do with Symfony. They are a concept developed as part of the Doctrine project to solve the problem of mapping ORM information to class methods. In this article we are going to build a small reusable bundle called WorkerBundle. Reusable yes, but still only for demo purposes so not really package-able. We’re going to develop a small concept that allows the definition of various Worker types which “operate” at various speeds and which can then be used by anyone in the application. The actual worker operations are outside the scope of this post, since we are focusing on setting up the system to manage them (and discover them via annotations). To see where we’re going, you can check out this repository and follow the instructions covered there for setting up the bundle in your local Symfony app. Each worker has to implement the above interface. That’s clear. But aside from that, we need them to also have an annotation above the class in order to find them and read some metadata about them. Doctrine maps the docblock annotation to a class whose properties represent the keys inside the annotation itself. Let’s create our own and see this in practice. 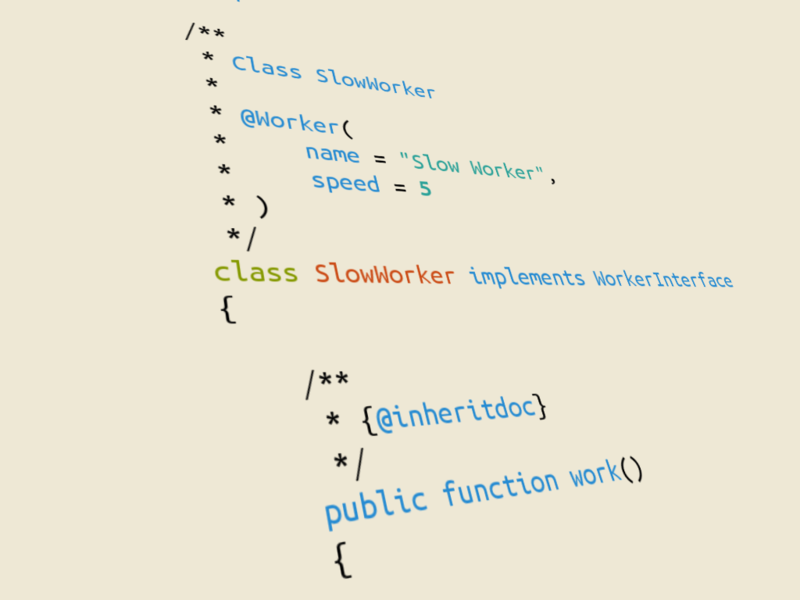 We’re going to keep things simple and have only two properties: the unique name (string) and the worker speed (integer). In order for this annotation to be recognized by Doctrine’s annotation library, we’ll have to create a matching class which, not unexpectedly, has some annotations of its own. * Returns a list of available workers. The WorkerManager class does two things: retrieves worker definitions (::getWorker() and ::getWorkers()) and instantiates them (::create()). As a constructor argument it retrieves a WorkerDiscovery object which we will write in a minute. The rest is pretty easy to understand. The ::create() method expects that each worker definition is an array which has a class key to be used for instantiation. We keep things simple here but of course in a real world scenario a next step would be to represent this definition using a separate class and delegate the actual instantiation to a factory. The first two constructor arguments are part of configuring our bundle. They are both a string that tells our discovery which folder it should look into and which namespace to use for loading the found classes. These two are fed from the service container definition we will see at the end. The rootDir argument is the simple path to the Kernel directory and the Reader instance is the Doctrine class we use for reading annotations. All of the magic happens inside ::discoverWorkers(). First, we establish the path where to look for workers. Then, we use the Symfony Finder component to look up all the files in that folder. Iterating through all the found files, we establish the class names of all the found classes based on the file name and create ReflectionClass instances we then pass to the annotation reader’s ::getClassAnnotation(). The second argument to this method represents the namespace of the Annotation class to be used. And for all the annotations we find, we build an array of definitions containing the class name that can be used for instantiation and the entire annotation object if somebody needs it. That’s it! Our discovery service can now look up workers without instantiating any of them. For more information, inspect the AnnotationReader class for the possibilities you have for extracting annotation data. There are also methods for reading method and property annotations which you can use by passing the relevant reflection objects. Nothing major is happening here. The WorkerManager gets the WorkerDiscovery as a dependency while the latter gets some parameters and the Doctrine annotation reader service. But in order for our service definitions to be picked up centrally by the container, we need to write a small extension class. So inside the DependencyInjection folder of our bundle, create a class called WorkerExtension. Both the location and name are important for Symfony to pick it up automatically. In here we are just using the ::load() method to include our services into the container copy that gets merged with the main container. These parameters are passed from the container to the WorkerDiscovery class as we’ve seen above. Pfff… our SlowWorker barely made it in to work today! We now have the power of using annotations to express metadata about our classes (or methods and properties). In this tutorial, we’ve built a small package that exposes the possibility for the application (or other external bundles) to declare workers capable of performing some work by defining some metadata about them. This metadata not only makes them easily discoverable, but also provides information on whether or not they should actually be employed. Do you use custom annotations in your own projects? If so, how do you implement them the Rauth way, or like we did here? Perhaps a third approach? Let us know! Interested in learning more about Symfony, Doctrine, annotations, and all manner of enterprisey PHP things? Join us for a fully packed three days of hands-on workshops at WebSummerCamp – the only conference that’s exclusively hands-on, and also takes care of anyone you’d like to bring along!